THE STORYKEEPERS PROJECT #24: WHAT’S IN A NAME? Daniel Truckey, Director and Curator of the Beaumier Heritage Center at Northern Michigan University brings to light the issue of names in this latest contribution to The Storykeepers Project. For a variety of reasons, family names can become altered over time. And for French Canadians long accustomed to life under the French regime, the transition to British and American rule frequently brought with it consequences for their family names that strike at the heart of our personal and collective identity. So often when I’ve told someone my last name, they will ask, “where does Truckey come from?” Some assume it is English or maybe Eastern European. They are often surprised by the truth, 1) it is a derivative of a French name and 2) I’m not exactly sure how it came to be. However, with respect to the second item, I have my suspicions. Many French-Canadian families across North America have a similar issue with their last name. The simple act of migrating to an English-speaking region of our continent changed many French names into phonetic equivalents. 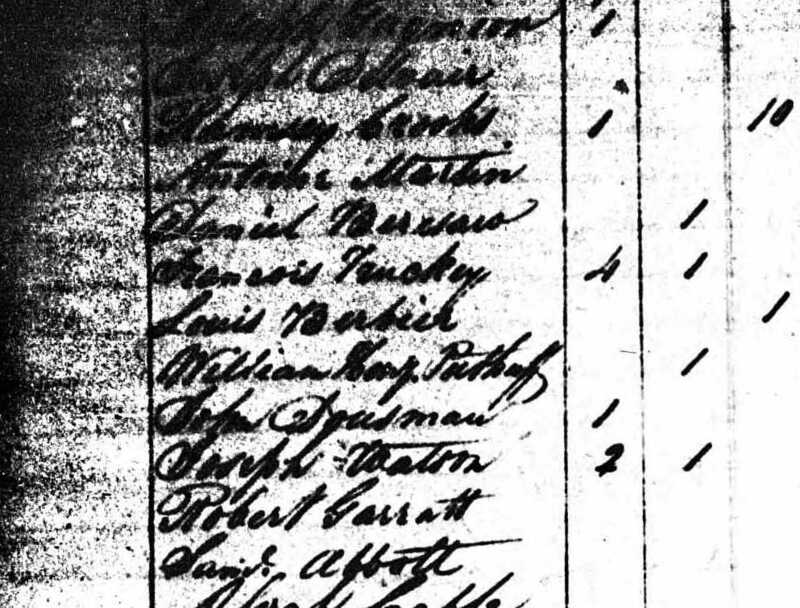 The first evidence that I’ve found of the name Truckey being used by French people was in the 1820 Michigan Territory Census for Mackinac County. In that census, there were a number of Métis people living on Mackinac Island and in St. Ignace with the name Truckey. With each successive census in the State of Michigan, the number of people with the Truckey surname grew exponentially. The descendants of these Métis traders spread out along the coast lines of Lake Huron and Michigan. In addition, new members of the family began to migrate to the lumber camps of Michigan from Quebec. My family was one of these late-comers. My great-great grandfather, René Trottier, immigrated directly to Marquette, Michigan in 1861, which his wife Narcisse (Dionne) and one-year old son, George. René came from a farming family in St. Pierres-les-Becquets, which sits alongside the southern shore of the St. Lawrence River between Trois Rivières and Québec City. Evidence shows that the family had lived in that part of Québec for several generations, as fur traders, voyageurs, teamsters, and farmers. In the 1870, Michigan Census, “Raney” and Narcisse are listed as “Truckey.” However, in the 1880 census, their name is listed as “Trottier.” In the 1900, census they are listed as “Truchey.” So why the switch? The change probably occurred with the first Michigan census in 1820, when census takers had to try to phonetically spell names that the subject was unable to spell. In truth, many French-Canadians who came to Michigan in the 19th century were illiterate and could not spell their own name. However, what accounts for the hard “C” sound in the name, versus the “ch”? The belief for a long time in our family was that it was simply a spelling error, i.e. the “h” looked like a “k.” The name also sounded more American than French and that might have been preferable to some French people who were trying to fit in and assimilate into American society. However, in 2011, I attended the French Alliance conference in Fargo, North Dakota. When I mentioned this mystery to a person at the conference, they said, “oh, yeah, Truckey. That’s how the name was pronounced by the Métis.” Though I don’t have further evidence of Métis transference of consonants in French names, it does fit with the fact that the first Trottier’s in Michigan to use the name Truckey, were Metis descendants. I believe that what happened with my family is that they were familiar with other Trottier families who already lived in Michigan. When they arrived, they were probably informed by those family members that the name had been changed to Truckey in Michigan, and they decided to follow suit. However, it is apparent from the change back to their original name in 1880, that this didn’t necessarily sit well with all of the family members. So what is in a name? For my family, it has really been more of a fascination and topic of discussion at parties than anything else. However, one my father’s cousins did in fact change his legal name back to Trottier. He was raised by his grandmother, who spoke little English and maybe she encouraged him to do so when he got older. Her other son, my grandfather Willard, was proud of his French heritage but wanted his children to be Americans first, and so he kept the name. There was a time that I thought of changing it back as well but now I’ve become accustomed to Truckey. It is who I am and it makes for a great icebreaker. I found that people whose name was Cayo were in fact Cadieux. Have not got around to write more on that lineage. I like what I read on this blog that preserve part of French-Canadian heritage in America. People should be proud of that heritage. I know I am. Of course this is easy for me living in Québec.